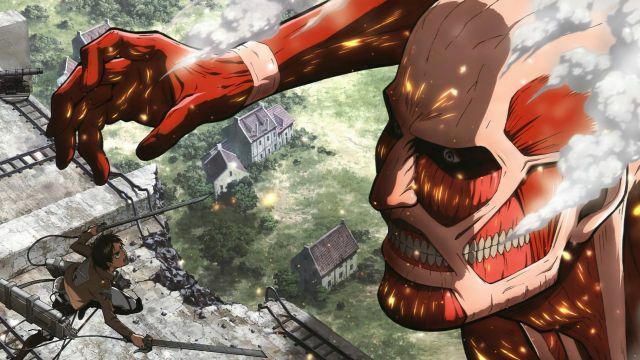 Director Andy Muschietti of It fame is developing the popular manga series Attack on Titan into a film series for Warner Bros., according to The Hollywood Reporter. Harry Potter producer David Heyman is producing the series alongside Masi Oka and Barbara Muschietti. Per the report, no screenwriters are attached at this point. Based on the popular manga series by Hajime Isayama, Attack on Titan takes place in a world where the remnants of humanity live inside a series of connected cities, isolated by enormous walls. These walls exists to keep the Titans out, gigantic humanoid creatures who devour humans seemingly without reason. These Titans have reduced the world’s population to staggeringly low numbers. The three main protagonists of Isayama’s manga are Eren Jaeger, his adoptive sister Mikasa Ackerman, and their friend Armin Arlert. Their lives are changed forever when a ‘Colossal Titan’ breaches the wall protecting their town, leading to the death of Eren’s mother. Vowing revenge and to reclaim the world from the Titans, Eren, Mikasa and Armin join the Survey Corps, an elite group of soldiers who fight Titans outside the walls. It has been adapted into an anime series that launched in 2013 as well as into a two-part, live-action film in 2015. This is just the latest in a long line of manga series that are making the jump to the big screen. Last week it was announced Legendary Pictures would adapt My Hero Academia for the big screen, to go along with the studio’s live action Detective Pikachu film starring Ryan Reynolds; and, of course, the anticipated Godzilla: King of the Monsters, which will hit screens on May 31. Robert Rodriguez’s long-in-development Alita: Battle Angel is the next live-action manga series hitting theaters on Feb. 14, 2019. The post IT Director Andy Muschietti to Adapt Manga Series Attack on Titan appeared first on ComingSoon.net.